This interview with Beau Abbott was done by John Gentry a wannabe cameraman at Stew Webb’s request in the 1990s and recently loaded on you tube by John Gentry of Dallas, Texas. I, Stew Webb was held as a Political Prisoner from 1992-1993 and meet and talked for weeks with Beau Abbott who was also a Political Prisoner at the Federal Prison in Springfield, Missouri also known as Siberia- USA. Beau Abbott, a former DEA Pilot was forced into and compromised into flying weapons to the Nicaragua Contras. Beau girlfriend who just had his child was murdered in Switzerland. 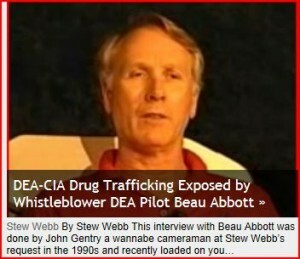 Beau Abbott’s boss was DEA Agent Santiberio who was murdered after being illegally arrested in San Antonia, Texas and feed a peanut butter sandwich laces with arsenic.